There is one tradition that I associate with Easter more than anything else: colouring Easter eggs. 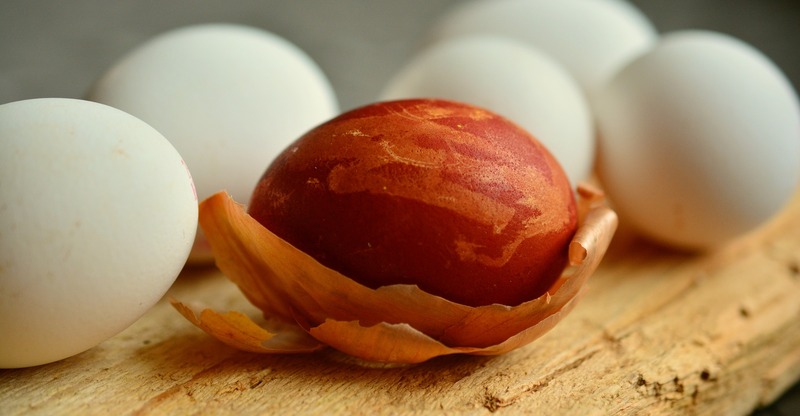 Growing up in Latvia, there was one method we used every single year – colouring eggs with onion skins. Onion skins are a perfect natural way to colour eggs and give the eggs a beautiful, reddish brown tone. But you can use a variety of other materials as well: chamomile gives a green-yellow colour, red beets will turn your eggs bright red, blueberries will make them violet-blue, coffee or black tea will colour the eggs light brown, whereas turmeric will give a beautiful yellow tone. Flowers, flower petals, leaves, cereal, grains, and anything else that you can think of that can be tied to an egg. Finding materials to use for colouring our Easter eggs was my favourite part of the process when I was little. As you probably know, the date of Easter changes from year to year and spring weather never arrives exactly at the same time either. So you would never know what you will find in our garden. An early Easter often meant that moss and snowdrops were all there was to be found and we had to be creative with materials found in the kitchen like oatmeal or rice. A late Easter, on the other hand, meant an abundance of leaves, grass, and flowers for colouring the eggs. First you need to make an infusion by boiling the onion skins. I usually take a sack of onions, remove the outer skins, put them in a small pot, fill it with water, bring to boil and boil for around 15 minutes, then turn off the heat leaving the pot on the hot plate. This is something that can be easily done ahead of time, for example, the night before. The stronger the infusion, the better the color! Now you can start preparing the eggs. Take an egg and make it a little wet so that your chosen materials stay in place a little better. Put the flowers, leaves, cereals (or whatever else you have chosen) on the egg and use a piece of gauze bandage to make it stay in place. Finally, secure the materials and the bandage by wrapping around some string. This is the part where you can really get creative – traditionally natural materials are used but beautiful results can be achieved also with paper ornaments, wool, paraffin wax, and many other materials. You can also wrap the eggs in an additional layer of onion skins to make the color especially rich, or leave some eggs decoration-free. Put the eggs in the infusion of onion skins and boil for 8-10 minutes. Then rinse them in cold water or keep in a bowl of cold water for 3-5 minutes. Finally, remove the string, bandage, and the other materials and admire the results of your work. If you thought that was the end of it, you are mistaken. These beautifully colored eggs cannot just be eaten like that, you need to battle with them first! The way we do it in my family is that everyone chooses an egg and competes with the person sitting next to them – first one holds their egg with the small end up and the other tries to break it with the small end of their egg, then they switch and try to break the large end of each other’s eggs. Repeat until there are enough broken eggs for an Easter breakfast. P.S. Do not forget to eat your eggs with salt, otherwise you will be lying for the rest of the year! Click to follow to the MKB page for more posts in this series and do not miss the roundup of Easter traditions around the world. Follow ‘s board Easter Around the World on Pinterest. So grateful to find this post! My dad’s side of the family is Latvian and his sister (my aunt) used to decorate Latvian Easter eggs this way when we were growing up. I have such fond memories of doing this. Glad to have detailed description of how it’s done, since it’s been such a long time since I’ve done it myself. Definitely going to carry on this tradition with my own daughter!